Living green isn’t only the right thing to do…it’s also the smart thing to do. • Don’t assume every room needs overhead lighting. Lamp lighting is more attractive, functional and practical for many rooms, such as living rooms and bedrooms. • Use task lighting judiciously instead of bright overhead lights. • Open the curtains to maximize daylight instead of turning on artificial lights. • Use fluorescent fixtures for ceiling lights and wall sconces that will be turned on more than two hours a day. • Dimmers are inexpensive ways to reduce wattage and can save wear on most types of bulbs. Dimmed light is also more appealing for many rooms, such as dining rooms and bathrooms. Most hall fixtures can be dimmed significantly and still supply adequate light. • Occupancy sensors can automatically turn lights on and off when a person enters and leaves a room. In lieu of installing occupancy sensors, put notes or stickers on switch plates to remind family members to turn lights off when they exit. • Timers are useful for indoor and outdoor light control, and can save energy by switching lights off at pre- determined times. • Motion sensors are useful for conserving outdoor light use and have security benefits as well. Lights with motion sensors only come on when movement is detected, saving energy and giving the impression that someone inside the house has switched on the light. • Photo sensors are a good idea for outdoor lights that need to be on continuously during evening hours. They switch off automatically when daylight is detected. • Consider installing solar power outdoor lighting, which has the advantage of lower electricity costs and the convenience of no wiring. • Linear fluorescent bulbs and compact fluorescent bulbs (CFLs) last up to 10 times longer than standard incandescent bulbs and use less energy to give off just as much light. CFLs also produce 75% less heat, so they can help with cooling costs. 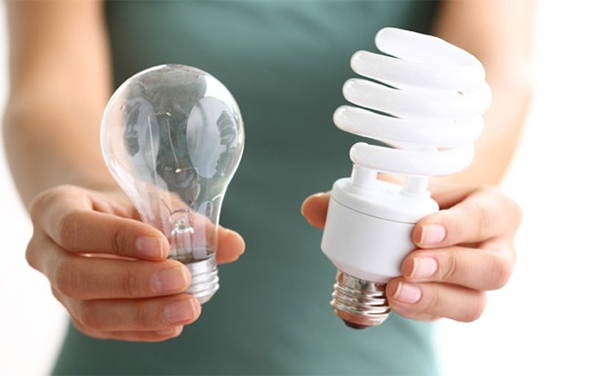 Because they don’t need changing as often, CFLs also help reduce waste. • Regularly clean lamp shades and light fixtures to reduce dust that interferes with light output. • Light Emitting Diodes (LED) are more expensive but use less electricity than incandescent bulbs and last longer. Read more in the Live Green Save Green Guide.